It’s a play that found itself on virtually every highlight tape of the 2012 college football season. Early in the fourth quarter, the No. 9 South Carolina Gamecocks found themselves on a brink of an early season upset at the hands of the Vanderbilt Commodores. The Gamecocks offense was sputtering and, down 13-10, a final quarter drive was needed in the SEC opener. Tight end Justice Cunningham was known as a blocker but on a second-and-seven from the South Carolina 47-yard line, the future Mr. Irrelevant was anything but that. Cunningham came off the line of scrimmage and ran a deep post with quarterback Connor Shaw finding the tight end over the middle of the field. At virtually the same time the ball found Cunningham’s hands, the tight end received a blow to the head, knocking his helmet off, but not before the ball was secured for a 20-yard gain, giving the Gamecocks the ball in Vanderbilt territory for the first time since the second quarter. “The Vanderbilt game was such a huge catch because it was such a physical play, such a clutch catch and their guy gets a penalty for hitting above the neck,” Joe Robinson, Cunningham’s tight end coach said. At 264 pounds, Cunningham fits the mold as a blocking tight end in the NFL but Robinson pointed to much more than just that. “I think he’s a tremendous receiver and in terms of the type of player and person, I really think that the Colts are going to enjoy him,” Robinson said. “He’s the kind of guy that you have to run out of the weight room and you’ve got to run him out of the meeting room. He’s the guy that always gives extra and always spends more time in the building than anybody else. Cunningham made 41 catches over the last two seasons at South Carolina and Robinson points to the tight end’s study of the Gamecocks’ offense on why he was so successful. As the final pick of the 2013 NFL Draft, Cunningham will undoubtedly have to find a role on special teams and after leading the Gamecocks punt protection unit, that should be no problem. 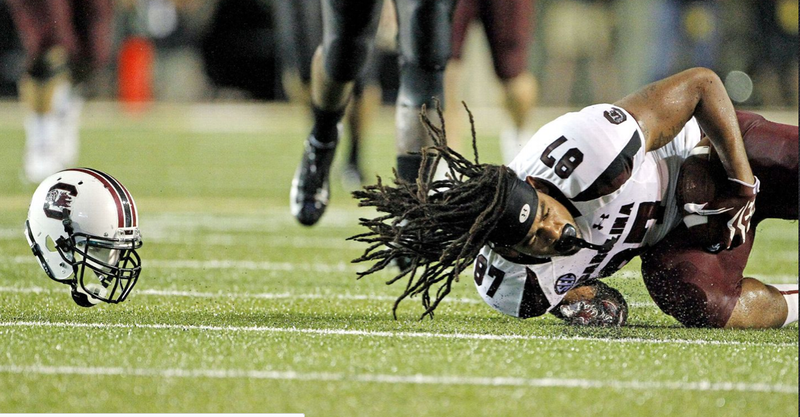 South Carolina’s Justice Cunningham hauls in a 20-yard reception in an Aug. 30 meeting against Vanderbilt. Photo courtesy of ESPN.